I can’t help it. I try not to be this way, but I find myself being this way. I love – yes, love – beautiful items that are also practical and make me feel beautiful. It is a combination I’m always searching for, but I rarely find it. From the first time I saw the products available on Nimli, I was thoroughly impressed. Nimli’s products follow the philosphy of a “natural, organic and green lifestyle” which I really appreciate. Though I do not necessarily search out these types of products, I think it is a bonus when I find items that I really like and I know they are also more environmentally-friendly! I was also amazed by the variety of products that Nimli has available on their site. From beautiful jewelry (I think these earrings are particularly stunning) to a great assortment of furniture, fashion and decor items for kids (including this cute print) to items for men, women and even pets (our family dog would love this toy), Nimli has items to match every budget and the needs of the whole family! 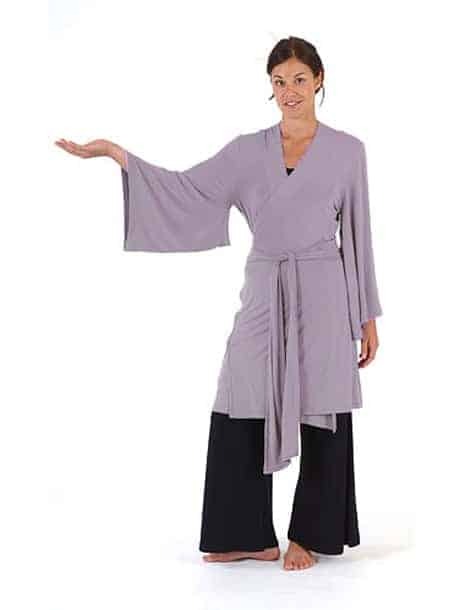 I had the opportunity to review the Dream Sacks Kimono Wrap in Wisteria .I have never owned any clothing made from bamboo, so I was interested to see how it would look and feel. When I unwrapped it, I was surprised at how soft material made from bamboo feels! It is soft and feels so good on my skin! I also liked how the materials hangs on me when I am wearing it – I thought it might be clingy like a jersey cotton but it has it flows instead of clinging, which I prefer! It was a great time to get this wrap as well because some evenings have been really chilly while others have been quite warm. I was pleasantly surprised to find that it on the cool evenings it has kept me warm while on the warm evenings it has actually kept me cool! And, as I mentioned before, the colour and style makes me feel beautiful as I’m moving around the house – this combination of comfort and style makes it a real winner to me! I am really impressed with my Dream Sacks Kimono Wrap and, given its quality, I’m going to see what else I like on Nimli as I think it is going to be regular stop during my online shopping from now on! I signed up for Nimliâ€™s email updates. I love the Jason Miller Goldfinch Teapot! I became a fan of Nimli on Facebook. I signed up for Nimli’s email updates.